Mizuno SHOWCASE Camp (Born in ’02 or earlier) August 26 to 31 More INFO! The Big League Experience presents our most prestigious camp, the Mizuno SHOWCASE Camp, August 26 to 31 in Oliver, BC. This camp is designed for players born in or prior to 2002 who are committed to improving their game and taking it to the next level, ie: college or professional baseball. Please note: Players born in 2002 must be pre-approved by BLE office. Unlike most showcase camps, the Mizuno SHOWCASE Camp gives players the opportunity to highlight their abilities to MLB and college coaches and recruiters over a FIVE DAY period. 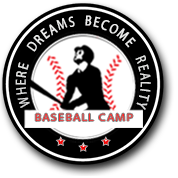 Camp will include sessions working directly with guest coaches (MLB scouts and US College coaches) on the field as well as seminars to help take your game to the next level. Camp will be on a 90 ft./60.5 ft diamond. The SHOWCASE camp will run simultaneously with the PROSPECTS camp, integrating during some drills but separate for games. Cost of the camp, including lodging, meals, BLE hat/shirt/shorts, coaching, seminars and supervision will be $795 plus 5% GST.